Single Ethernet Adapter, double the efficiency! Spigen 3-Port Ethernet Adapter comes in a compact, unibody form to support both capabilities of an Ethernet Adapter and USB compatibility. 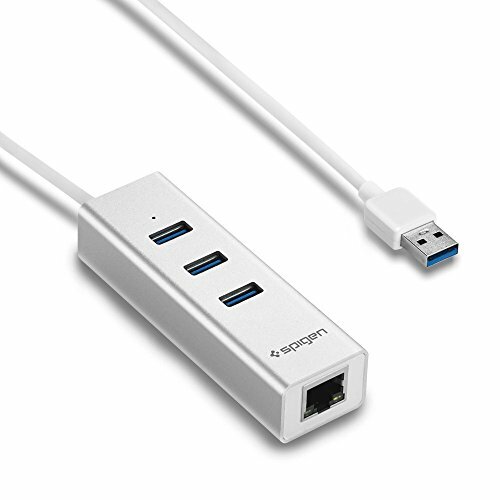 It contains 3 USB 3.0 ports for optimum productivity, supporting data transfers with speeds of up to 5Gbps. Use it to replace your broken internal network port on desktop or laptop, add a separately routable network interface, or for lightning speed data transfers over a single Ethernet port! Supports Windows (32/64 bit) 10 / 8 / 7 / Vista / XP, Mac OS 10.5 or higher; Driver-free for Mac OS.